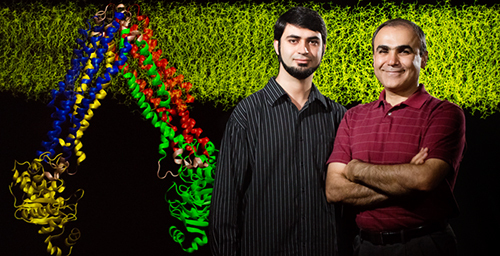 Postdoctoral researcher Mahmoud Moradi, left, and biochemistry professor Emad Tajkhorshid discovered how a transporter protein changes its shape to shuttle other molecules across the cell membrane. CHAMPAIGN, Ill. — Researchers have tried for decades to understand the undulations and gyrations that allow transport proteins to shuttle molecules from one side of a cell membrane to the other. Now scientists report that they have found a way to penetrate the mystery. They have worked out every step in the molecular dance that enables one such transporter to do its job. 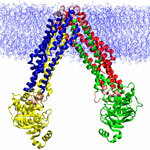 VIEW VIDEO | An animation depicts the changes that allow a protein transporter to do its job. The transporter in the study, MsbA, belongs to an ancient family of proteins that carry large molecules across membranes. It is the bacterial version of a transporter in human cells (called p-glycoprotein) that helps pump drugs out of the cell, said Emad Tajkhorshid, a University of Illinois professor of biochemistry and of pharmacology who led the research. P-glycoprotein is overexpressed in some cancer cells, helping the cells eject drugs meant to kill them. Research on large, membrane-bound proteins like MsbA has always been problematic because they are not easy to crystallize (a common technique for determining a protein’s three-dimensional shape) and each crystal structure reflects only one of the many conformations these shape-shifting proteins undergo, Tajkhorshid said. “If you want to design a drug for a protein usually you look at the structure and see how you can design a molecule that binds to a particular conformation,” he said. Knowing all the different conformations a protein adopts will offer more targets for drug design, he said. Before this study, researchers had to guess at the changes that occurred between the transporter’s inward-facing (open to the cell interior) and outward-facing (open to the cell exterior) states, the only two known conformations. Rather than guessing, Tajkhorshid and his co-author, postdoctoral researcher Mahmoud Moradi, took a more painstaking, but ultimately more fruitful, approach. They used molecular dynamics simulations to look at many potential pathways leading from one conformation to the other, simulating individual steps in the transport cycle in atomic-level detail. Then they measured the energetics of each step to discover which steps required the least work, and thus were most likely to occur. “The main thing that was new here was trying many pathways and using what we call non-equilibrium work – how much work it takes to walk that path – to judge the quality of the pathway,” Tajkhorshid said. Their simulations included every atom in the protein, the adjoining membrane and the surrounding water molecules – about 250,000 atoms in all, the researchers said. “It took us many months to search as many possible paths as we could imagine connecting the two end states,” Tajkhorshid said. “And when we did that we slowly realized that we could discover much better pathways” than those that had been proposed before. The result was what the researchers call a “minimum work path” leading from one known protein configuration to the other. The research indicates that MsbA has components in its interior that are locked together as long as the transporter remains open to the cell’s interior. A series of random undulations gradually lead this middle section to twist, unlocking those components and allowing other changes that eventually open the protein to the outside of the cell. The new approach will aid other studies of complex protein transporters whose behavior has baffled researchers, Tajkhorshid said. “This is the first time that we are characterizing a very complex structural transition at atomic-level resolution for a large protein,” he said. Tajkhorshid is an affiliate of the Beckman Institute for Advanced Science and Technology at the U. of I. Editor's note: To reach Emad Tajkhorshid (pronounced uh-MOD tazh-CORE-shid), call 217-244-6914; email tajkhors@illinois.edu. The paper, “Mechanistic Picture for Conformational Transition of a Membrane Transporterat Atomic Resolution,” is available online or from the U. of I. News Bureau.